The album itself was actually recorded/mixed in 1985, but I will spare you with further details of that era (Rock me Amadeus, anyone?). 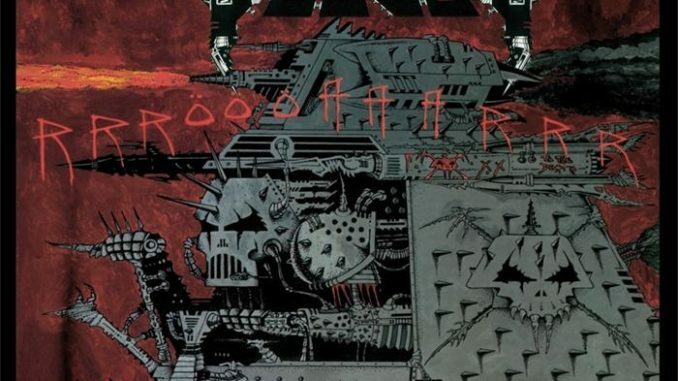 The cover has a tank that looks left and reminds me of drawings metalheads do in school when they are bored. I feel weird reviewing the gods of Avantgardemetal, for I never really listened to them back in my days, I’ve only had this weird vinyl picture disc where there was one Voivod song on it but unfortunately I can’t find it anymore. All in all I can safely say and see that this album has its moments and I adore the title and some of the lyrics.